During the month of January I’m participating in the Boost Your Budget Pantry Challenge series that is being co-hosted by myself, Mommies Point of View, Mama Does It All, Crunchy Frugalista, Pary Moppins, Going Crazy Wanna Go?, The Frugalista Chick, Matter of Cents, Coupon Pals, Thrifty Divas, Frugal Mom of Two, How About Free, TheItMom.com, All The World Is Art, Sweeping The USA, Fab Find Foodie, Making Time For Mommy, Adventures in Coupons, Full Price? NEVER!, The Frugal Navy Wife, Generations of Savings and A Savings WOW! and we’d love it if you’d join us as well. So here’s the deal – this January we have all been challenging ourselves to eat from our pantries – to use up all that excess food sitting in the back of the cupboards, hiding in the refrigerator door, in the stockpile and from out of the freezer – and limit our shopping to as little as possible. I have really concentrated on using money maker deals to cover my staples like milk and eggs and I’m super excited to announce that BEFORE I do my shopping trips for today, I’ve spent a net of $31.84 so far for the month. I set a challenge budget of $100 at the beginning of the month but I didn’t know then that Zaycon Foods would be coming to Florida during January with beef and bacon. I’ve been so excited about doing well during the challenge that I decided to go ahead and order some of each and it was delivered this weekend. That cost me $206, but that’s STILL below my normal monthly budget of $300 so I’m thrilled! Plus, between Saturday’s meat delivery and what we still have left in the freezer, I’m planning to keep up with the challenge and continue all my new good habits at least through the end of March! How are you doing on your pantry challenge goals this month? Remember to leave a link to your post or comment below about your progress in the pantry challenge and you’ll be entered to win a $25 Coupon Clutch gift certificate. One participant who either leaves a link to a challenge post or a comment about their challenge progress will win each week! Congrats to last week’s winner – Danielle from The Frugal Navy Wife! So here’s the deal – this January we plan to challenge ourselves to eat from our pantries – to use up all that excess food sitting in the back of the cupboards, hiding in the refrigerator door, in the stockpile and from out of the freezer – and limit our shopping to as little as possible. I really overspent the first week of the challenge at almost $37, with a goal of spending less than $100 for the month, so I’ve been concentrating on finding “money maker” deals to try and cover my staples like milk and eggs and I’ve actually managed to bring my total down below $37 so far for the month! I’m super excited about that and about having a menu plan ready for the rest of the month. Now that I’ve really tightened up we’re doing pretty well for the month and I’m actually hoping that we can extend our challenge through the month of February too! How are you doing on your pantry challenge goals this week? Remember to leave a link to your post or comment below about your progress in the pantry challenge and you’ll be entered to win a $25 Coupon Clutch gift certificate. One participant who either leaves a link to a challenge post or a comment about their challenge progress will win each week! Congrats to last week’s winner – Stacy from Adventures In Coupons! It feels so good having the menu planned in advance for the whole month! I’m participating in the Boost Your Budget Pantry Challenge this month so we’re using up things we have on hand in our stockpile, freezer and pantry and that feels pretty awesome too. The first week of the challenge I really overspent at almost $37, with a goal of spending less than $100 for the month that really was way overboard so I’m very pleased to have only spent $22 this week! We’ve still got a ways left to go before the month is over, but I’m excited to have a menu plan ready for the rest of the month. 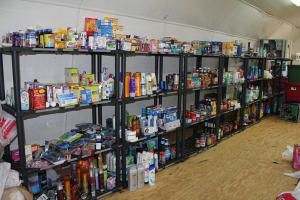 Since I inventoried the freezer and stockpile last week I realized that we’ve got enough on hand that we can extend the challenge into February as well! How are you doing on your pantry challenge goals this week? Remember to leave a link to your post or comment below about your progress in the pantry challenge and you’ll be entered to win a $25 Coupon Clutch gift certificate. One participant who either leaves a link to a challenge post or a comment about their challenge progress will win each week! Congrats to last week’s winner – Julie from Pary Moppins! During the month of January I’m participating in the Boost Your Budget Pantry Challenge series that is being co-hosted by myself, Pary Moppins, Going Crazy Wanna Go?, The Frugalista Chick, Matter of Cents, Coupon Pals, Thrifty Divas, Frugal Mom of Two, How About Free, TheItMom.com, All The World Is Art, Sweeping The USA, Mommies Point of View, Mama’s Money Tree, Crunchy Frugalista, Fab Find Foodie, Making Time For Mommy, Adventures in Coupons, Full Price? NEVER!, The Frugal Navy Wife, Generations of Savings and A Savings WOW! and we’d love it if you’d join us as well. I’ve set a budget for myself of $100 this month and I’m rather embarrassed that I’ve already spent $36.89 in just one week. With more than three weeks left to go I’m really going to have to buckle down! My other goal for the week was to get an inventory of everything in the freezer and I’m happy to say that I got that done. I was really surprised by the amount of blueberries (11 packages) and chicken that were hidden in there! We just had a chicken delivery from Zaycon Foods this weekend that hasn’t even made it to the freezer yet so I think we’re set with chicken for a few months. I just found out that they’re coming back with beef and bacon at the end of the month and I may have to break down and order some of each for the freezer so we have some variety over the next few months! How are you doing on your pantry challenge goals this week? Remember to leave a link to your post or comment below about your progress in the pantry challenge and you’ll be entered to win a $25 Coupon Clutch gift certificate. One participant who either leaves a link to a challenge post or a comment about their challenge progress will win each week! 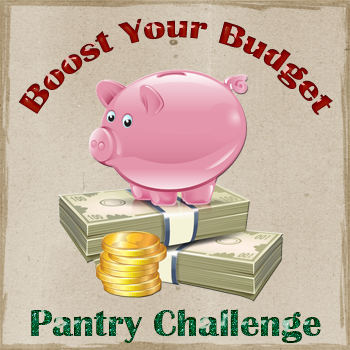 I’m very excited to announce the new Boost Your Budget Pantry Challenge series that I’ll be participating in and posting about throughout the month of January! The Challenge is being co-hosted by myself, Pary Moppins, Going Crazy Wanna Go?, The Frugalista Chick, Matter of Cents, Coupon Pals, Thrifty Divas, Frugal Mom of Two, How About Free, TheItMom.com, All The World Is Art, Sweeping The USA, Mommies Point of View, Mama’s Money Tree, Crunchy Frugalista, Fab Find Foodie, Making Time For Mommy, Adventures in Coupons, Full Price? NEVER!, The Frugal Navy Wife, Generations of Savings and A Savings WOW! and we’d love it if you’d join us as well. This is not a “no spend” month, this is a “make do with what you have on hand and spend as little as possible” month. Everybody’s personal goals will be different and we can each set our own rules – the point is merely to challenge ourselves and start off the new year with a boost to our budgets! We’re also giving away a $25 Coupon Clutch gift certificate each week to one participant who either leaves a link to a challenge post or a comment about their challenge goals. Won’t you join us? My personal goals are to get an inventory of what we have in the stockpile (check out the mess it has become over the past couple of busy months) and in the freezer and eat for the month from what we already have on hand. I don’t plan to give up Friday date night out with hubby and I’ll still be making my weekly shopping trips but I will ONLY be buying staples and free or really cheap deals (to tell my readers about of course 😉 My hope is to keep the spending for the month to under $100 for groceries, toiletries and cleaning supplies for my family of seven. I feel lucky to have such wonderful co-hosts to challenge me and help me on stay track, and we want you to join us, too! 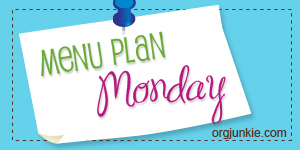 Each Monday during January we’re going to post an update of our goals and how we’re doing at meeting those goals through the linky below. So figure out what your goals are – is it to save money? to have more room in your pantry? to stop wasting food and thus help the environment? Figure out why you want to participate in the challenge – I look forward to hearing what your goals are! I’ll be spending tomorrow (thank goodness the kids are going back to school!) doing an inventory of my pantry, stockpile and freezer so that I’ll have an accurate idea of what all I’ve got on hand and can get started on planning some menus! 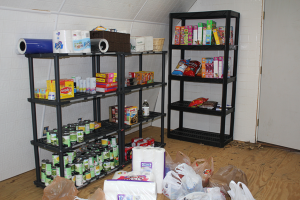 In January of this year I participated in a Pantry Challenge where we attempted to eat from our cabinets, pantry, freezer and stockpile as much as possible and keep our spending for the month to a bare minimum. It was a lot of fun and actually pretty amazing to see just how little we could spend for the month. Another great side effect was starting out the year so far below budget! I’m excited to be doing a Pantry Challenge again in January 2012 and I’d like to invite you to join in! I’d also love to find a few bloggers to co-host this event by hosting the challenge linky on their blogs and doing a post each Monday of the month. This is not a “no spend” month, this is a “make do with what you have on hand and spend as little as possible” month. Everybody’s personal goals will be different and we can each set our own rules – the point is merely to challenge ourselves and start off the new year with a boost to our budgets! We’ll also be giving away a $25 Coupon Clutch gift certificate each week to one participant who either leaves a link to a challenge post or a comment about their challenge goals. Won’t you join us? If you’re a blogger and you’d like to help co-host this event, simply leave your blog name and info in the linky below and I’ll email you soon with the linky code and further details.